Hi everyone! My name is Bridget Deehr, @stealfashion. I am guest blogging for @KayLoire and Shareology today. Usually you can find me blogging for stealfashion.com, which is a fashion and style site that launched in January 2008. I write about affordable fashion ideas and creating your own style on your own budget. When I hear of a good cause, I feature retailers, like Kenneth Cole, who use their influence to benefit non-profit organizations, such as Soles4Souls. Soles4Souls is an amazing organization that collects new shoes and forwards them to those in abject poverty, while helping to raise donations to support devastated countries. You can check out their other divisions as well, Clothes4Souls and Hope4Souls. 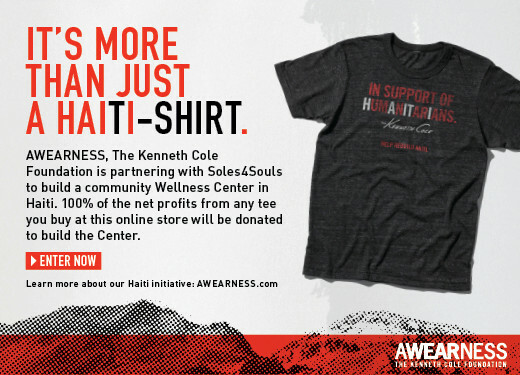 The Kenneth Cole Foundation is partnering with Soles4Souls for a national shoe drive to help rebuild earthquake-torn Haiti. Bring your new or gently used shoes to a retail store or outlet store, and receive a 20 percent discount off your purchase as a way of thanking you for your generosity. You can also donate $10 at the stores’ checkout or online at kennethcole.com. Visit Kenneth Cole on Facebook to purchase a limited-edition T-shirt. For every “like” on their Facebook post, the retailer will donate $1 towards the construction of a community wellness center in Haiti, (up to $15,000). The fundraising offer ends September 16, so don’t let the opportunity to do good pass you by. Thanks for stopping by and hope to see you soon!